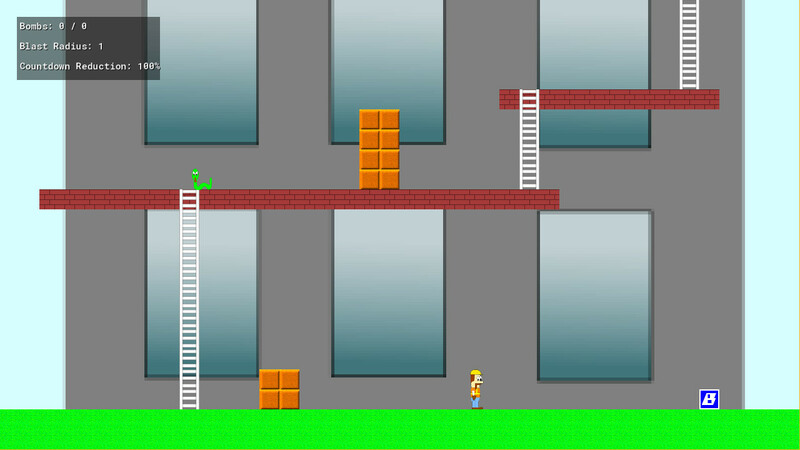 Help the construction worker climb the ladders to get to the top of the building to flip the switch to initiate the demolition of of the building. Along the way, you will come across numerous obstacles. Use your trusty bombs to destroy the destructible blocks in your way. You will come across foes such as snakes and birds, which will send you back to ground level. These enemies can be defeated with bombs, but you must carefully place them as there is a countdown until the bombs explode. Powerups are available to increase your maximum number of bombs, increase blast radius, and reduce countdown time. Be aware that some powerups are hidden behind destructible blocks. Two exciting levels to complete! Can you make it to the top? Ok I ragequitted after being hit by a snake without really touching it at 3 different times. So... You put countdown reduction powerups because you knew how long the bomb were to detonate, right? WHY WOULD YOU TORTURE US LIKE THAT??? It takes 10 WHOLE SECONDS to explode. WHY. And it's only a 20% reduction, so you still have to wait HEIGHT SECONDS. (also, "countdown reduction" is a 100% at the start, then 80% after the powerup, that's not how maths work) You could have easily cut by half the countdowns and EVEN THEN that would have been too long. And the snakes are soooo slooooowwwww. You either attempt to calculate where it will be to kill it with a bomb, or you try and walk behind it to clim the ladder while it's on the other side, but then you get killed because you character is like 3 times faster than the snake and they both have huge hitboxes. I'm sorry about they way I'm talking, but this design is extremely frustrating. 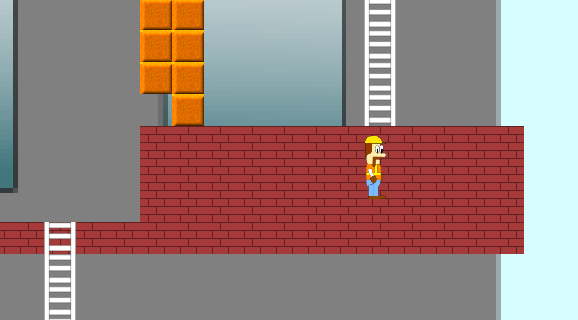 I get that you wanted to have a "countdown" in your game, but the first line of your description is "Help the construction worker climb the ladders to get to the top of the building to flip the switch to initiate the demolition of of the building.". This is a countdown right there. Initiate the demolition then get out fast. A countdown that speed up the game and bring tension, the OPPOSITE of what your bombs are doing. Interesting fighting mechanics in both defense (not getting trapped in a corner) and offense (predicting where the snakes will be when the bomb explodes). It's a decent use of the theme. I like the colorful graphics and the animations but I would prefer the characters to be a bit bigger or the view to be a bit smaller so I can see them better. The physics are not that polished. You can climb down a ladder and get stuck in the floor. There are countdown reduction powerups.